Grundisburgh is a good village, settled around its green with the beautiful St Mary's church on one side and the Dog public house on the other. 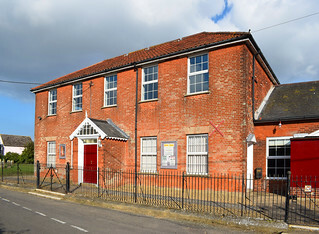 The former village school, now sheltered housing, overlooks it all. Roads run through fords to cross the streams which cut through the green, and it is all very charming. 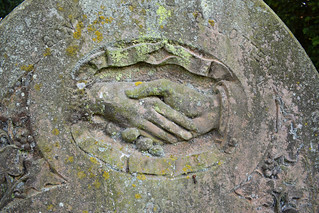 Somehow though, the settled scene serves to emphasise the fact that in any age there are outsiders who do not necessarily feel a part of the mainstream, and in East Anglia in general, and in Suffolk in particular, the tension between non-conformism and the establishment over the centuries has left a legacy. When the Baptists of Grundisburgh came to build their chapel in the late 18th Century, it was unthinkable that it could be part of this harmonious village centre. Instead, they built it out in a hamlet on the road to Great Bealings, where it stands to this day. 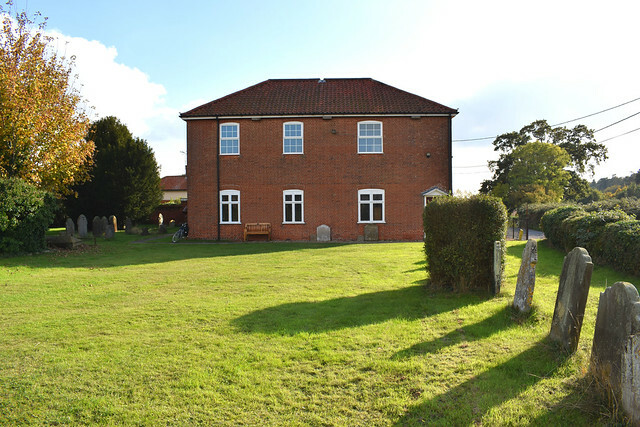 This is a fine, typical Suffolk Baptist chapel, originally constructed in 1798. Schoolrooms and a house for the minister were added to the south side in 1819, and the street sides were refaced in red brick in the 1860s. At the time of the 1851 Census of Religious Worship, the Reverend George Edis Webster, Rector of St Mary's church down in the centre, bemoaned the fact that Grundisburgh has many Baptists, and said that his own congregation of barely a hundred, in a parish of eight hundred souls, was much influenced in these scattered villages by the weather. 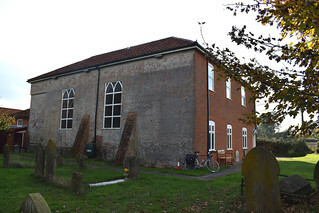 Meanwhile, out at the Baptist chapel, the minister Samuel Collins recorded that his chapel had seating for 700 people, and an average attendance of more than 400 in the morning, more than 600 in the afternoon. The Reverend Webster countered that the Baptist attendants come from '9 or so' parishes. Even so, there were affiliated chapels in both Woodbridge and Waldringfield, and a large chapel burial ground, which is still in use today. An interesting insight then, into the tension between the established church and the non-conformists in a 19th Century Suffolk village.